The camp manager said it best in the beginning. 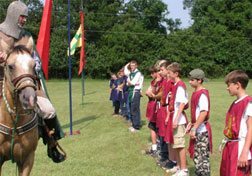 The TFP’s 2nd Annual Call to Chivalry Summer Camp for boys in Louisiana really was quite different. 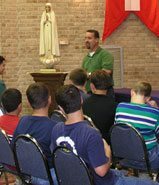 The focus was not on computers or basketball like other camps but on Catholic heroism. 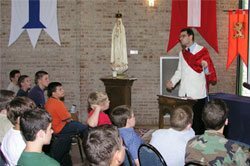 The July 1-10 camp in rural Norwood near the Mississippi border put together the right mix of prayer, study, outings and games making it an unforgettable experience for the 12-18 year-old participants. It was equally memorable for some accompanying dads who provided plenty of support and Cajun cooking. This year’s boys came from Louisiana, Texas, Arkansas and even faraway Scotland. TFP speakers also put together a series of lectures that called to mind the Catholic heroes of times past. However, it was very clear that these age-old values of the Faith are not to remain in the past but be applied to the modern world. The program’s lectures and talks were based on many of the principles developed in Revolution and Counter-revolution by Prof. Plinio Corrêa de Oliveira. Participants studied the four most important Revolutions in the West: the Protestant Revolution, the French Revolution, the Russian Communist Revolution and the “hippy” revolution of the Sixties. Instructor Byron Whitcraft talks about the most important Revolutions in the West to an attentive audience. They also discussed inspiring examples of Catholic heroism and chivalry such as the Battle of Lepanto in 1571. Honorary Albanian Consul Bret Clesi spoke on the Catholic hero Skanderbeg. Theatrical presentations helped illustrate the points and the boys were encouraged to discuss and debate revolutionary trends in culture they might confront in their daily lives. 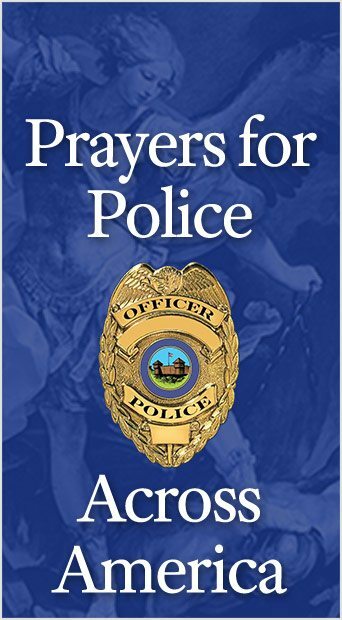 There can be no real heroism without prayer. Thus, there was a spiritual dimension to the camp. From the raising of the papal, American and TFP flags in the morning to the torch-lit rosary procession at night, the role of prayer was emphasized before and after every meal, event or game. Msgr. Robert Berggreen of St. Agnes parish in Baton Rouge delivered talks on examination of conscience and Confirmation, which he termed the sacrament of courage. There was even a night “vigil of arms” where potential young knights prayed a half hour in the middle of the night asking for the graces to confront the very different peaceful and legal moral battles of today. Plenty of physical activity was worked into the program which included swimming, canoeing, horseback riding, field games and hiking. Field trips to the Vicksburg National Military Park, the Port Hudson State Historical Site and historic Natchez, Miss., gave an historical American perspective to the course. The high point of the summer course was the closing medieval games and banquet. Parents joined their sons to watch the activities. Knights on horseback rallied two teams who tested their courage and knightly qualities in “medieval games” which ended with a grueling yet satisfying obstacle course race. Msgr. Berggreen present souvenirs at the final banquet. 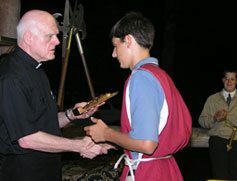 The closing banquet began with a rosary procession leading into the woods where a picnic pavilion was almost magically transformed into a medieval banquet hall. The Cajun cuisine was indeed a royal treat as parents, sons and TFP supporters feasted and the final speeches given. Msgr. Berggreen presented souvenirs to the boys and prayed as the exciting week ended. Ended? Yes, but it also began another phase in the lives of the participants. They were invited to put the lessons learned to good use. They were asked to prove that chivalry is not dead. Catholic heroism lives on precisely where it is needed — in the souls of Catholic youth who will face so many obstacles to live their Faith.